The PowerShot SX710 HS is a perfectly capable camera for those who just want a point and shoot with a long zoom range, but it can't shoot raw files, which will limit its appeal for enthusiasts. 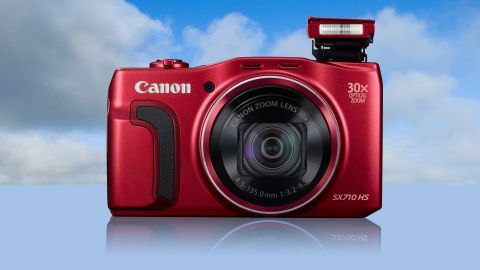 The headline feature of Canon's SX710 travel compact camera is its 30x optical zoom, which gives you an impressive equivalent 35mm focal reach of 25-750mm and a maximum aperture range of f/3.2-6.9. There's also a digital zoom, which boosts that reach to 60x. The 30x zoom extends from the body when the camera's in use, but disappears back into the body when you power off. At its heart, the SX710 has a 20.3 million pixel 1/2.3-inch CMOS sensor and a Digic 6 processor – the same processor found in some of Canon's recent DSLRs. Other interesting features of the camera include inbuilt Wi-Fi and NFC, full HD video recording at 60p and the ability to capture images with digital filters applied. The SX710 is appealing to both absolute beginners and to those with a little more experience of photography. On the back is a small mode dial which enables you to quickly switch between different exposure mode, including full manual and semi-automatic modes for those who want to take control, plus fully automatic and scene modes. If you're shooting in manual mode, you can alter both the shutter speed and lens aperture, and you switch between them by pressing the Up directional key and scrolling the dial which surrounds it. There's a function button in the middle of the rotating dial which accesses the quick menu so you can change key settings quickly and easily without having to delve into the main menu. The SX710 has a Hybrid Auto mode which shoots 2 seconds of video with each still image. When shooting in automatic mode, you can choose to shoot in Hybrid Auto mode, which will shoot a two-second video clip before each photo you take, compiling them all together at the end of the day. It's a fun feature for holidays, weddings, parties and so on, though it would be nice to be able to use it in other shooting modes. You switch to the Creative Shot mode to use the camera's digital filter effects. Firing off a shot will result in five random filters being added, but unfortunately you don't have control over the options or exposure. I found the camera's Wi-Fi is pretty straightforward and easy to use, there's a dedicated button to activate it and instructions are presented on the screen. In good light, the SX710 produces lovely vibrant colours and images which have a good overall impression of detail at normal printing and web sizes. If you examine images shot at low sensitivities (such as ISO 100) at 100% it's possible to see a small amount of image smoothing, but they stand up well against images from other compact cameras of this type. This wide angle shot shows how close you can get with the 30x optical zoom (see next picture). Click here for a full size version. At the telephoto end, there's still a good amount of detail resolved, while image stabilisation has done a good job of keeping blur to a minimum. However, if you're shooting in lower light and you need to move up the sensitivity range, such as ISO 800 or ISO 1600, there's much more image smoothing and loss of detail, although the overall impression of detail is still decent when viewing at normal web or printing sizes. ISO 3200 is the maximum sensitivity setting available, but it's best to avoid it unless absolutely necessary as images appear smudgy. The camera's all-purpose metering copes very well and produces accurate exposures in the majority of conditions and, similarly, the automatic white balance copes well with artificial light without erring towards warm tones. Images taken at the far reach of the optical zoom display a good level of detail, making the camera handy for travel shots. The digital zoom is usable at small printing or web sizes too, if a little smudgier. Activate the camera's macro focusing when shooting close-ups, and you can also get a shallow depth of field effect. Straight from the camera, colours have a nice vibrant appearance. This camera is mostly aimed at holidaying photographers, but perhaps with a little photographic knowledge. In bright light, it fulfils that task very well, and the 30x optical zoom gives you plenty of scope for shooting different subjects on your travels. If you attempt to use it in lower light, it's a little less impressive. Overall though, it's a pretty capable camera, and the fact that it has full manual control is good news for anybody even slightly serious, but it's a shame not to see raw format shooting as we have with the Panasonic TZ70. Inbuilt Wi-Fi and NFC connectivity is a handy, if not particularly unique feature nowadays, and it works fairly well when you want to take selfies or group shots. The fun elements of the camera, such as Creative Shot and Hybrid Auto, would be improved with a little more control over what you can do with them, but they're still a nice touch for Instagram fans. We shoot a standardized test scene in lab conditions to check the camera's performance across a range of ISO settings. The right side of this setup is deliberated darkened because this makes any noise more obvious. Below you'll find the test results from both low and high ISO settings. ISO 100: Click here for a full size version. ISO 3200: Click here for a full size version. The 30x optical zoom covers an excellent range of focal lengths and gives plenty of flexibility for the average holiday shooter. There's nothing too major to dislike about the SX710, more a number of small niggles, such as the lack of a touchscreen, the fact you can't shoot in raw format and the lack of flexibility with creative shooting modes. A nicely capable camera for those who just want a point and shoot with a long focal length. Manual control is a nice touch for those who need it, but a number of small missing features make the SX710 less than perfect.